Every ill America faces has its roots in the debasing of the US dollar. Easy money allowed power-hungry politicians to build a warfare/welfare state and betray our own hard-won independence and freedom by transforming the United States into a globalist empire. 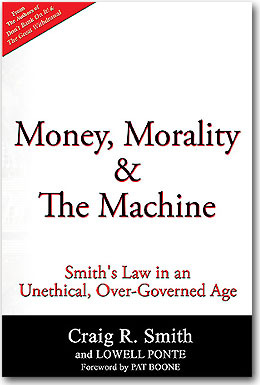 "In this book my long-trusted friend and advisor Craig Smith and former Reader's Digest Roving Editor Lowell Ponte look at what has happened to our values since politicians switched Constitutional dollars…for today's paper dollars backed by...nothing," writes Pat Boone in his Foreword. Fasten your seat belt, Money, Morality & The Machine is a page-turning rocket ride. Craig and Lowell take us from the pizza's debut in ancient Rome to tomorrow’s robotic age and to our cashless future featuring Star Trekonomics. It reveals how you can save yourself and your family from The Machine that is right now locking the escape hatches around us. To receive a complimentary 12-page Executive Summary simply call 800-289-2646 or register online.